The Salesforce.com’s suite of platforms and applications offer enterprises the ability to roll out rich customer-facing applications quickly, with no hardware or operations infrastructure required. The suite provides both packaged solutions, like the Salesforce CRM Customer Portal, and a platform for custom application development. However, challenges can arise when enterprises need to integrate systems not built on Salesforce.com, or not built within the same Salesforce.com organization. Solving this problem with custom software development is difficult, time-consuming, and potentially very expensive. 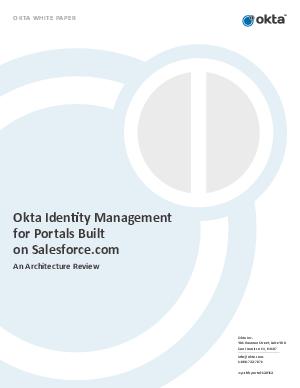 Okta’s identity management service solves these problems by allowing organizations to present a single, well-integrated web application to all customers and partners, who can navigate it with a single set of credentials. Download this paper to learn more.